My husband says I move 20% faster than a normal person. He says it’s how I get so much done every day. Also, why I trip over toys constantly and frequently stub my toes on corners, door jams, chair legs, table legs and other people’s feet. Usually I consider my super speed a blessing. Not so much when working with phyllo dough. It is a little tricky, very thin and requires careful methodical preparation. Which is probably why I’ve never used it much. I know my limitations. Slow and steady is most certainly not a strength of mine. For this traditional Greek appetizer, I was willing to give it my best shot. 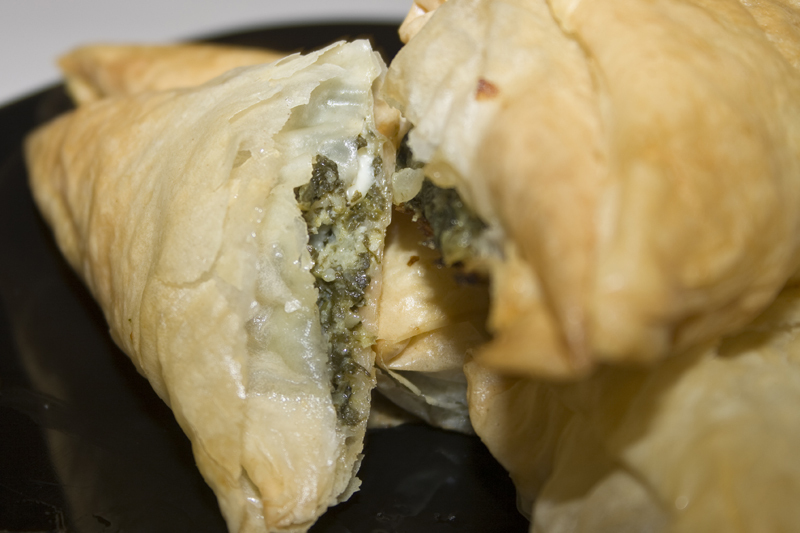 The payoff of flaky, crisp triangles bursting with melty cheesy spinach was totally worth it the effort. I mashed together a couple different recipes to come up with the one I ultimately used, borrowing a little from The Food Network and Allrecipes. The result is a perfect hand-held appetizer that’s sure to please at any party. Bonus – you can do all the work ahead of time and pop them in the freezer until you need them. They go from frozen to flaky perfection beautifully. I started with fresh baby spinach. Sauteed in a pan until wilted. Then drained and roughly chopped it. Cooked up a little onion until soft and translucent. Then combined the drained, chopped spinach, onions and two kinds of cheese. 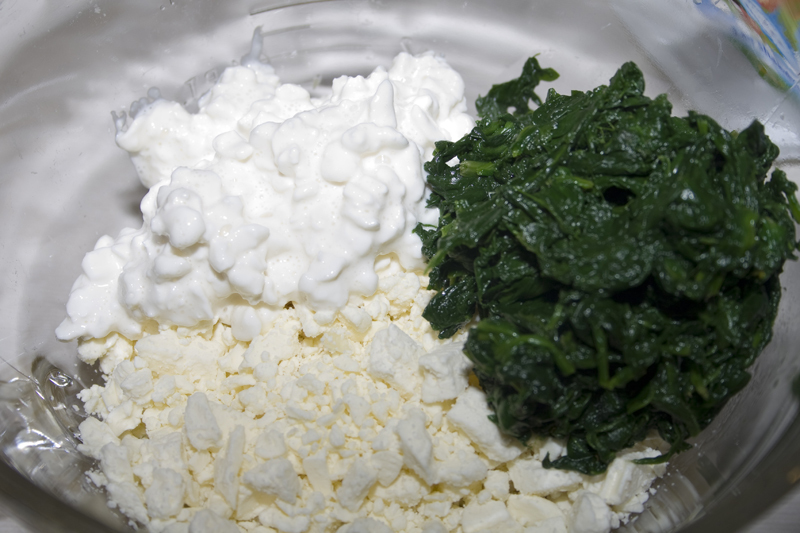 I went with a combo of cottage cheese and feta. Not the traditional ricotta/feta mixture. A little salt and pepper and mixed it all together. Then came the tricky part. 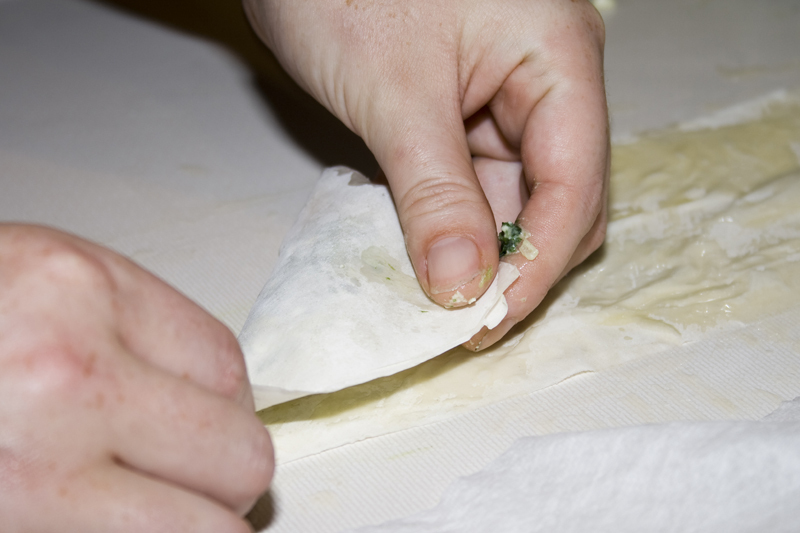 To keep your phyllo dough pliable while you are making up the triangles, you need to keep it covered. Otherwise, it dries out, becomes brittle and just snaps apart when you touch it. I cut my dough into strips with a pizza wheel, stacked it up and draped a couple slightly (very slightly) damp paper towels over it. At this point I also prepped my pan by brushing it with melted butter and got some paper towels ready to drape over the finished triangles as well. Pretty much every recipe I read on spanakopita says to use one phyllo sheet at a time, but I realized after making up a few that I was going to have WAY too much dough for the amount of filling I had. 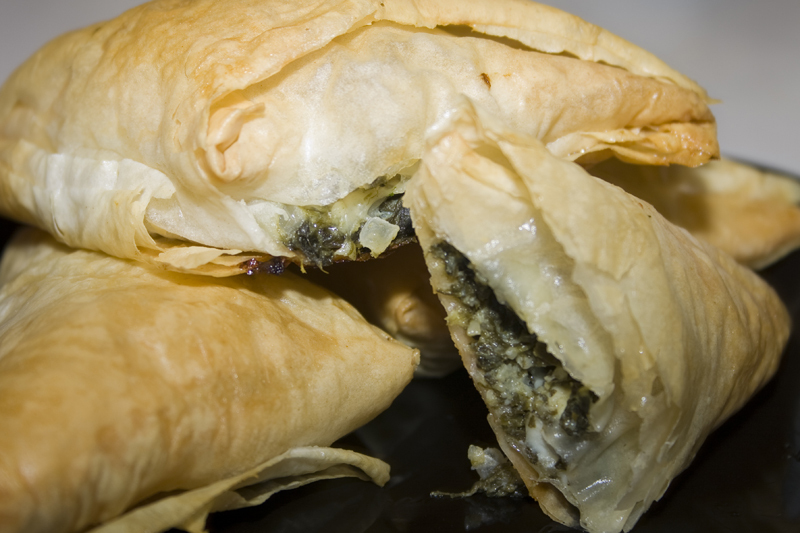 It was going to irritate me greatly to waste half a package of phyllo. Plus, I wanted my triangles to have lots of flaky layers. So, I decided to use two sheets at a time. Brush one with butter, place another on top and brush with butter again. More flakiness and more butter can only be good in my book. Place a teaspoon of filling at the bottom corner then begin folding. Then up again (like folding a flag) the opposite direction. Apparently I’m very messy with butter. Continuing folding side to side until you reach the top of the strip. Brush with butter to get the last fold to stick if necessary. Totally off topic, I have informed my husband that it’s time to get me dark granite counters. I need them so you all can see dough better. Brush your completed triangle with butter and place on prepared baking sheet. Don’t put them quite as close as this picture shows if you’re planning to bake them immediately. I froze most of my batch (with wax paper between the layers) so I could cook them up fresh when I needed them. The dough does puff up when it’s baked so give your triangles some personal space on the cookie sheet. When these were baking, it filled my house with rich buttery smells that were almost too much to handle. They came out golden and gorgeous and full of spinach goodness. Yuuum. A little pocket of heaven. Fantastic. Absolutely totally worth the effort. Heat 1 tablespoon of the oil in a large saute pan, add half of the spinach and saute until spinach wilts, tossing with tongs, about 2 minutes. 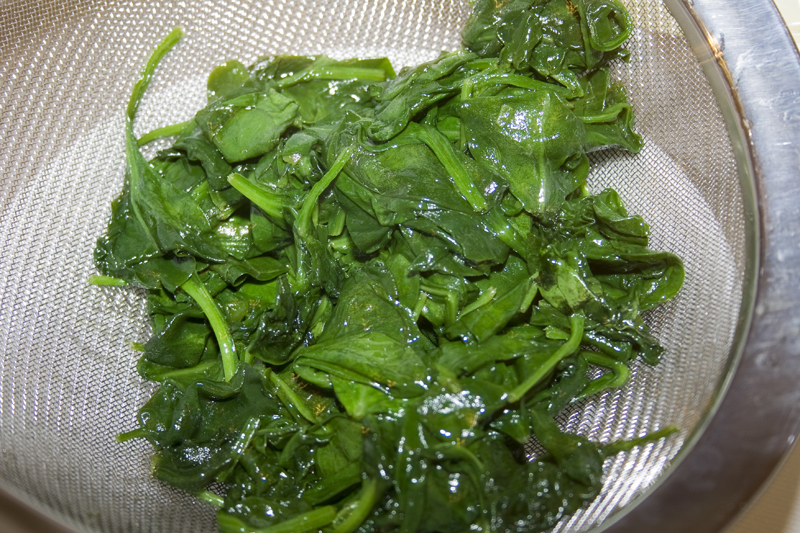 Remove spinach and squeeze out excess liquid, then chop roughly. 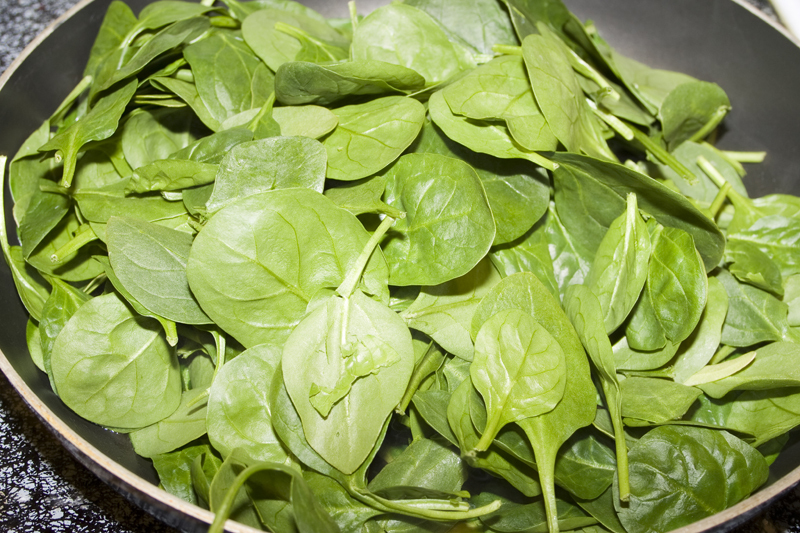 Repeat with remaining spinach, using 1 more tablespoon of olive oil. Pour off any liquid from the pan, and add remaining olive oil. 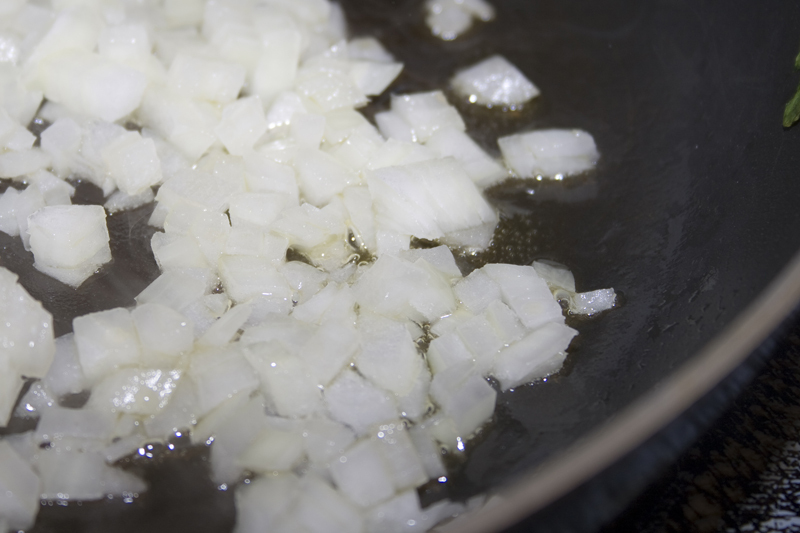 Add onions and saute until soft, about 2 to 3 minutes. Add the spinach to the onions, salt and pepper. Cook over low heat for 1 to 2 minutes, then remove from heat to cool. (This part can be done ahead and kept refrigerated). 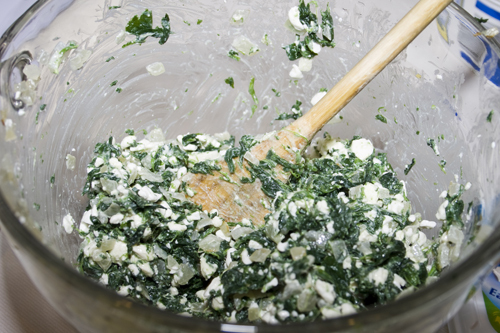 Stir the feta, cottage cheese and as much beaten egg as needed to moisten the cooled spinach mixture. 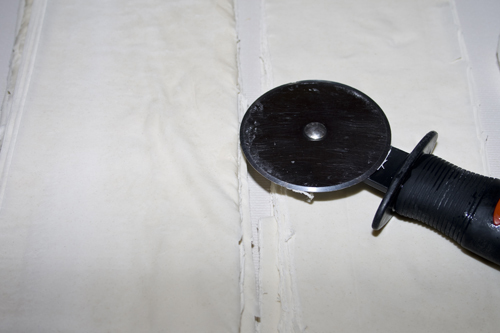 Unroll the filo dough on a flat surface and keep it covered with waxed paper and a damp towel so it doesn’t dry out and become brittle. 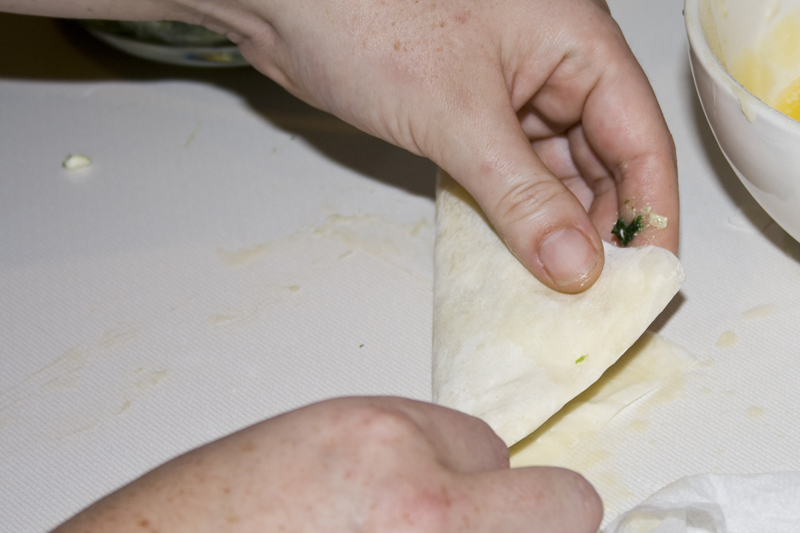 Using a sharp knife or pizza wheel, cut the filo into 3 by 11 inch strips, and recover with the towel. 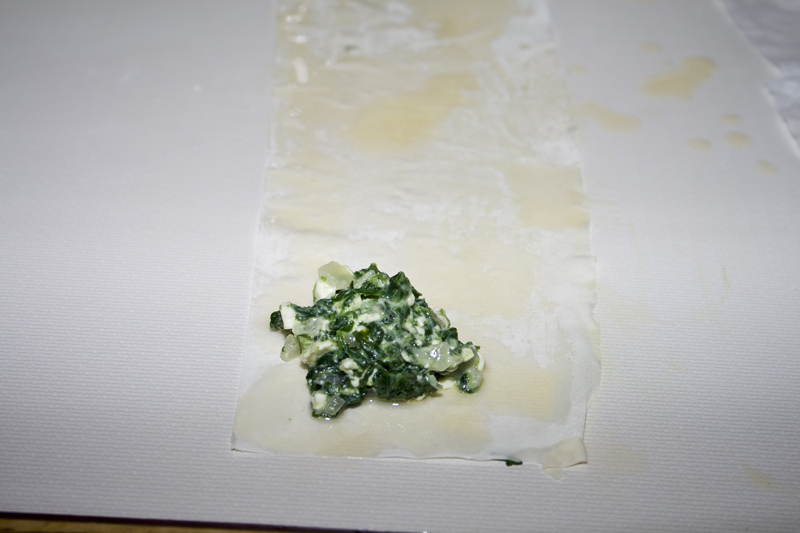 Use a pastry brush to brush a strip of filo with melted butter. Place another strip on top and brush it with butter as well. 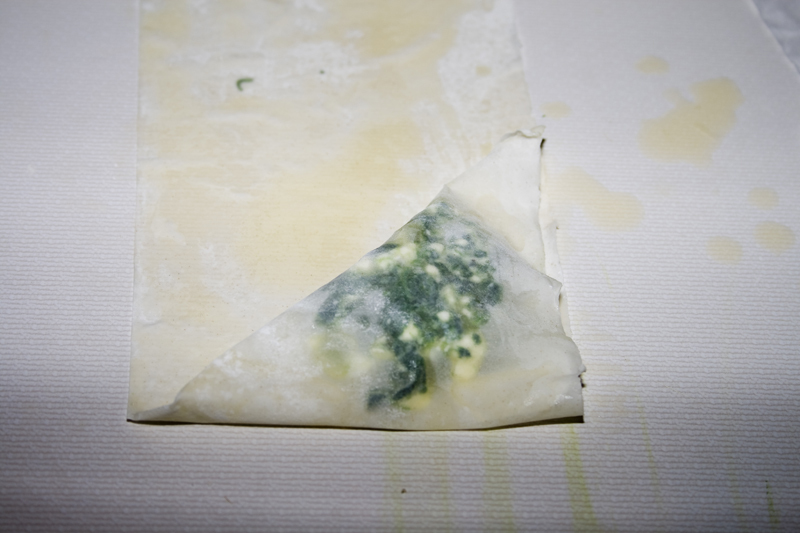 Place a small spoonful of spinach filling 1 inch from the end of the pastry. Fold the end over the filling to form a triangle, then continue to fold up the strip in triangles, like folding up a flag. 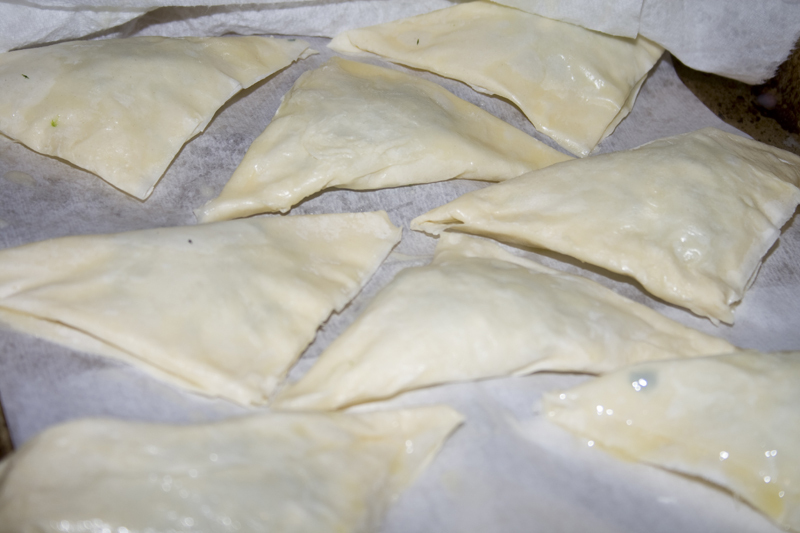 Continue with remaining strips of dough, placing filled triangles on the baking sheet and keeping them covered with a slightly damp paper towel until all are ready to bake.